What better way to end a Team-Building Day, than with a Salsa party – with a Disco! At the end of the day, your team members can relax, and wind down, with the entertainment supplied by ourselves: there will be the opportunity for your team members to try out what they’ve picked up from their class or just relax and take it all in. 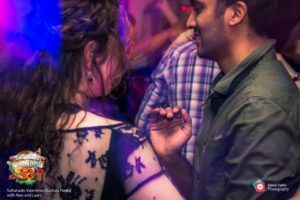 We keep the party going and energy high all night with our animation and line-ups where we get everyone involved in the fun.